Tim Ferriss pointed out today – while early-voting in San Jose – that no one checked his ID before he exercised his Constitutional right. “Interesting,” I thought… “no one really checked my ID either”. I mean, I showed up at the polling place and handed them my voter registration card, but my card is basically a piece of paper with my name and address printed on it. Easily forged with any inkjet printer and cardstock paper. So what gives? 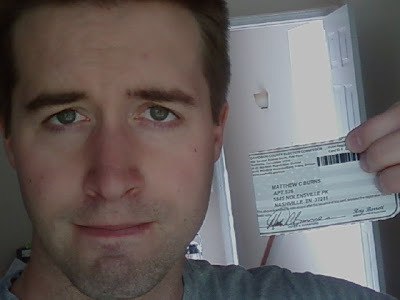 Why didn’t they cross-check my voter card with my picture ID? It just seemed to me that there wasn’t a lot of diligence in that regard. But the touchscreen voting machines worked very well. And there was no line. Overall, my Nashville voting experience went extremely well. As you now know, I’ve gotten myself a new job. As such, the wonderful carpooling arrangement Steph and I have had for the last 3 years is being disrupted and we need to get a car so she can get to work. Unfortunately, the vast majority of my time off so far has been dedicated towards this end, and if I’m honest, this has been the most awful car buying experience I’ve ever had. This is the story of how Steph and I purchased a lemon bomb of a terrible car and then blew $600 extra dollars on a car I never truly owned. We started out two weeks ago with your typical internet searches and used car lot shopping. Our goal was something truly inexpensive – cash only – reliable enough to get Steph through for the next year, 10 miles of driving a day. We had some decent leads, but nothing remarkable. But then we stumbled upon a ’97 Infiniti i30. The price was right: $2,500. The car looked good on the outside and according to the owner – a private seller – had been an extremely reliable car for the past two years. Now hear me through. Regardless of the debacle about to unfold, I still have no ill feelings toward the seller… he’s a good, honest guy and I think we both got sucker punched. After a couple test drives we decided to buy the car. We were both comfortable with it, were aware of it’s known quirks, and were anxious to make a purchase because I was leaving town for the week. Now it’s important to know that I, a fool from Minnesota, bought a car with the ‘check engine’ light on. Um, OOPS!! In my naivety I didn’t think that a ‘check engine’ light was a big deal, and in Minnesota it’s not. We don’t perform emissions tests in Minnesota and growing up it seems my family has always owned a car with that silly light on. It’s not a big deal – usually some obscure electrical fluke. Well, in Davidson County, Tennessee they don’t treat the little orange light as obscure. As soon as we bought the car we took it to the testing facility where it promptly failed. The $10 test indicated that our Knock Sensor and Speed Sensor were failing. We figured we should take it to the closest mechanic shop to see what was up, so off to Christian Brothers Auto. They charged us $85 for a diagnostics test – likely used a piece of equipment that cost little more than that – and told us our Knock Sensor and Speed Sensor were failing, and causing the ‘check engine’ indicator. Estimated cost to replace both sensors: $938. After gathering the bits of shattered bone lying on the floor from our jaws dropping, we hightailed it out of there. May I Have A Second Opinion? Since the car was in fair working condition I left town for my road trip, leaving Steph with the new Infiniti for the week. Miraculously it worked ok while I was gone. Then on Friday when I got back we took the car to a local mechanic, recommended by a friend whom we knew could be trusted. He again charged us $75 for a diagnostics test and told us that the Knock Sensor and Speed Sensor were failing. Thank you for the insight. But this particular mechanic did offer some helpful advice and cautioned us that these error codes we were seeing were likely the result of other hidden issues impossible to detect, most likely an imminent car computer failure ($800+ to fix). Our $2500 car was quickly becoming a $5000 money pit, just to pass the emissions test, and I guarantee this car was NOT worth $5000. By this point we are quite angry and beyond frustrated. It’s clear we have to unload this worthless piece of junk – this ridiculous lemon of a car. So we went to CarMax to get a quote for dumping it. $1200 is what they offered. But that was before the alternator failed on our way out of the parking lot. Please understand the fury I am trying to restrain within myself at this point on a cold Friday night. The long and short is I’ve got nearly $3000 sunk into a car that I’ve purchased and desperately need to get rid of. But I cannot even sell it!! I cannot sell the car because I technically don’t “own” it. I don’t own it because I can’t get a clean title. I can’t get a clean title because I can’t get it registered. I can’t get it registered because I can’t pass the emissions test. And I can’t pass the emissions test because total repairs will cost me well in excess of $2500. And this I can’t afford. Reluctantly I call the previous owner who sold me this time bomb on wheels and explain my awful plight. I present a scenario where either he buys the car back from us at a reduced price, or he helps us sell it at CarMax (because we need his signature). He requests some time to think about it. Steph and I go to bed stressed out of our ever-loving minds. Meanwhile we begin shopping for another new car for Steph, knowing that one way or another the Infiniti is going bye-bye. We spend a better portion of Saturday traipsing all over Southern Tennessee used car dealerships. And then somehow, in an act of charity I’m still trying to comprehend, the previous owner of the ill fated Infiniti calls and offers a full $2500 buyback of the car. Talk about dodging a bullet. In a moment of gracious weakness I offer to help him split the cost of fixing the alternator since it “happened on my watch”. My act of charity involves getting the car to an affordable mechanic to fix the alternator, so after some phone calls Monday morning I get the thing hauled to Firestone. $400 repair on the way. I spend the rest of Monday and then Tuesday (today) shopping for cars (this time from dealers… no more private sellers). And I’ve learned my lesson here as well: demand that the car be taken to a mechanic for review. Adding insult to injury, on my way back from a mechanic reviewing a car, I get pulled over by Nashville’s finest on Old Hickory Boulevard. This particular cop is unhappy that I am driving 50 in a 45, and is also curious if I can show the registration and proof of insurance for the car… which I explain that I cannot because it’s obviously a dealer’s car (hence dealer plates on the back). He is not all that amused and proceeds to cite me for all three offenses. Oh, then Firestone called and said the alternator on the Infiniti was fixed, but the battery is now dead. 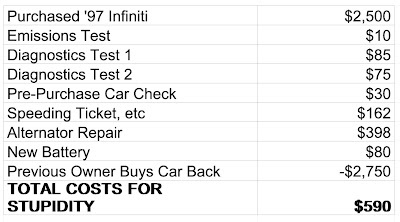 I’m sure many people own Infiniti’s and don’t have a problem, but my two week experience was excruciatingly painful. Finally this evening we made a purchase on a new car for Steph (an Acura), and we unloaded the Infiniti on the previous owner (which I feel bad about, but it was necessary). Assuming there’s an outside chance that one of my few diligent readers hasn’t heard yet, a couple weeks ago I resigned my position with EMI and accepted a new job with Word Entertainment as their Director of Digital Sales & Marketing. This is a good thing! (People always ask me that… I tell them I switched jobs and they give me that, ‘oh, really?’ as though my dog died or something). So I have to sound excited when I say it, because I am excited! Anyways, after nearly 5 years at EMI, switching companies is a big deal – it was an incredibly hard decision to make, and didn’t come easily. I have a ton of great friends at EMI, and not working with them everyday is going to be sad. EMI had become home, just like highschool had become home, and then college. Additionally, I really respect a lot of people at EMI – they have great and supportive leadership, and from the top down some brilliant minds that I have learned a lot from. But now it’s onto something new. At Word I’ll be working for a record label instead of a distribution company. This means instead of working nearly 250 releases in a year, it will be more like 20 – if that. Ideally this means that I’ll have the opportunity to create a closer relationship with the artists I work with, and dig deeper into each release – spending the time on each one that they deserve. At Word I’ll be working with all digital download, streaming, and mobile accounts. Previously I had 95% of my focus on iTunes, which was necessary, primarily because of the amount of titles I had running through the system. Ideally now I’ll be able to dig a little deeper with each one – there’s some cool new accounts doing some great things, and I’m excited to have the opportunity to spend some time with them. Word has a different perspective on approaching digital music and internet marketing. Not to say that Word has the ‘right’ way, and EMI the ‘wrong’ – it’s just different and I need that fresh perspective. Like I said, I’ll be working within the label, and they’re putting a lot of focus on 360 degree artist deals, direct-to-consumer commerce, and fully integrated internet marketing teams. I’m looking forward to being part of a bigger team, and in a position to have more open discussion with radio, A&R, and so forth. So that’s the brief run down. My last day with EMI was October 8th, and I don’t start with Word until November 3rd (which means I’ve been enjoying the most amazing fall break ever). This is my last week on my own, which I am doing my best to dedicate towards completely refreshing myself. 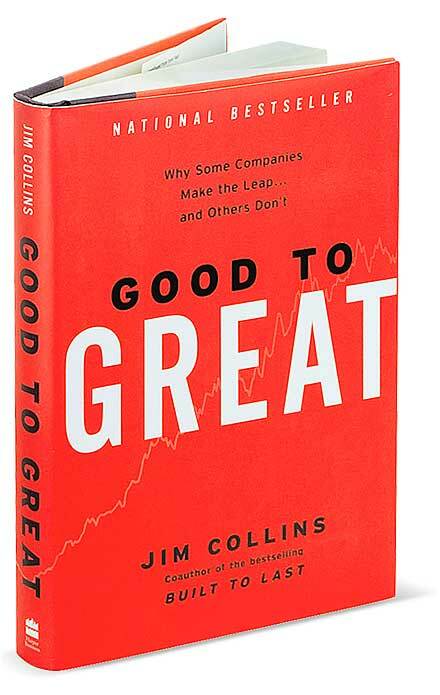 I’ve been reading some good books, enjoying some good coffee, taking some nice trips, and trying to refrain from anything that reminds me too much of corporate gobbledigook. I haven’t posted for a long time, and every day I think of something I want to write about. It dawned on me why I don’t do it though. I’m too obsessed with being a perfectionist (especially when it comes to writing). I want it to cover everything, and not lack anything. I create grand plans of writing a 7 post series on this, and a step-by-step analysis of that. And in the end I don’t think anyone really cares, but I feel like that’s what I need to do. So I end up not writing. And therefore, no post in weeks. To that end, I’m purposely writing this little tidbit in less than two minutes, and then I’m going to publish it without so much as a proofread. This is me pushing my horizons. PS: I lied… I proofread this, but I think I’m still within two minutes.